Truman Capote's Cherry Pie Recipe | Good. Food. Stories. Today we’re proud to introduce Eating My Words, a new feature by contributor Rebecca Peters-Golden where we’ll revisit food scenes from literature and recreate the dishes described therein. Rebecca, a graduate student in literature at Indiana University, is also a compulsive baker who has been known to make three-layer chocolate cakes out of boredom, so we’re happy to make the most out of her vast talents with this series. While visiting my sister in Philadelphia this past December, I was bemoaning the grayness of winter and wishing for more fun in my life. Always eager to make me stop whining help, my sister suggested that I participate in the Philadelphia Artclash Collective‘s annual “Fun-A-Day,” through which I might combat precisely such grayness and lack of amusement by creating something every day of January. Projects ranged from the artistic (some genius painted a picture of a Buffy character every day) to the happenstance, and everything in between. But what would I do that would be truly fun?! In the year and a half before Fun-A-Day, I had been working on my dissertation in literature and feeling a creeping anxiety that reading for pleasure was becoming a thing of the past. To this end, I wanted not only to do something that would combine my favorite things—reading and cooking—but also to remind myself of the pleasure I take in reading by removing it from the realm of the purely academic and placing it in the realm of . . . well . . . fun. So, I decided to recreate some of my favorite moments of food in literature. And then, you know, eat them. Now, six months and many, many sticks of butter later, I feel at peace with literature and more excited about food than ever. For my first good food story, then, here is Truman Capote’s combination of literature and food: a scene from In Cold Blood , Capote’s non-fiction novel that tells the story of the 1959 Clutter murder in Holcomb, Kansas. “Nancy and her protégée, Jolene Katz, were . . . satisfied with their morning’s work; indeed, the latter, a thin thirteen-year-old, was agog with pride. For the longest while she stared at the blue-ribbon winner, the oven-hot cherries simmering under the crisp lattice crust, and then she was really overcome, and hugging Nancy, asked, ‘Honest, did I really make it myself?’ Nancy laughed, returned the embrace, and assured her that she had—with a little help. . . . Jolene cut a piece of pie. ‘Boy!’ she said, wolfing it down. ‘I’m going to make one of these every day seven days a week’ ” (24-25). Make the crust by pulsing the flour, sugar, and salt in a food processor. Add the butter and pulse on and off for three seconds each until the mixture resembles cornmeal (about 10 seconds total). If you’re into it, you can spice the crust up with 4 cherries blended in! Transfer the mixture to a large bowl and sprinkle with the ice water. Mix gently with hands until the dough comes together in a ball (add another tablespoon of ice water if dough is too dry). 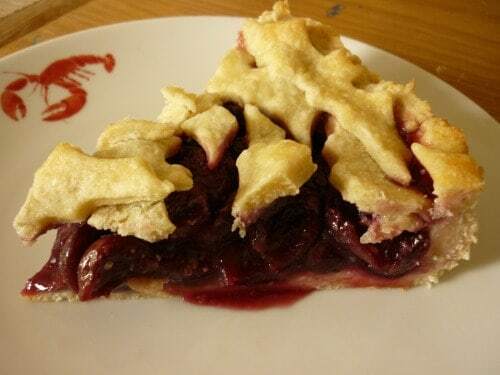 See Casey’s great step-by-step pie crust instructions. Divide the dough into two disks, wrap each in plastic and refrigerate for 30 minutes while you pit your cherries and preheat your oven to 450?. Combine the cherries, sugar, and salt in a large saucepan over medium heat, and stir occasionally until the sugar and salt have dissolved. Reduce the heat to low and add cornstarch, stirring constantly until the liquid is slightly thickened and the cherries are soft and slightly macerated. Take the cherry filling off the heat and stir in the butter and vanilla extract. Remove the dough disks from the fridge and roll one out on a floured surface until the round is about two inches larger than your pie plate. Drape the dough over the rolling pin to transfer it to the pie plate. Pour the cherry filling into the bottom crust (keep back some liquid if it looks like it’ll drown your pie). Roll out the second dough disk and cut the top crust as you please. 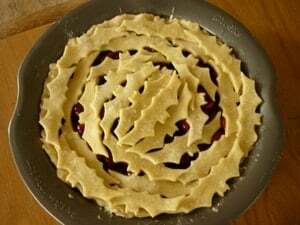 I like to cut shapes with a cookie cutter and overlay them (I did this one with bats, as seen above), but you can weave lattice strips or keep the dough as a round—however, remember to cut slits for air vents in an intact top crust so steam can escape from the hot, bubbling filling bubbling. Brush the crust with cream and sprinkle with turbinado sugar, if desired. Bake at 450˚ for 10 minutes, then reduce the temperature to 350? and bake for another 25-30 minutes or until golden brown. Cool the pie on a rack for at least 30 minutes before serving to let the juices thicken.